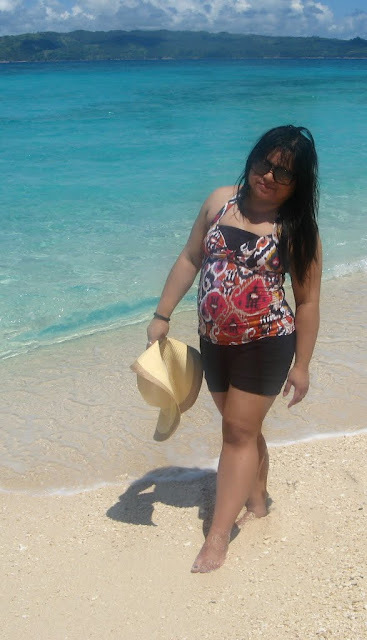 Like I mentioned before, I was at Boracay last October 22-24. It was a wonderful treat for me after a week (or more like a month!) long of super hard work at the school where I'm teaching. 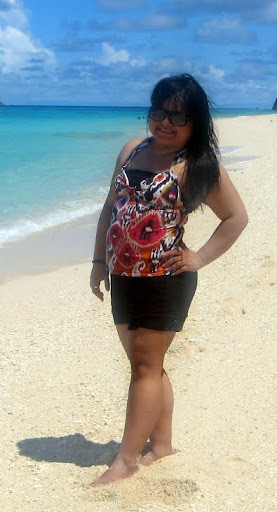 I was with my students during that time even in Bora so I'm in super conservative dress up mode. LOL. Actually, even if my students weren't there, I'd still wear THIS much at the beach. Yes, still a bit body conscious so I'm wearing black shorts and black tube top coz my Kenneth Cole Swimsuit reveals too much cleavage.. even for me! LOL! Anyway just a back story of this swimsuit-- I got this when I went to the States last 2010. I was at Ross' (of all places!) and found this cute "Tankini" - Tank Top Swim Wear with matching bikini. (Yeah I'm wearing the bikini but you won't catch me just wearing only that! Shy ako.. haha) Anyway, when I saw the print and that the brand was Kenneth Cole, I was very happy! I don't normally wear these colors but I'm glad I got it coz its a very generous print. It hides a lot of "flaws" LOL! So thanks to Kenneth Cole Swimwear, I was able to enjoy my Boracay Vacation without worrying or be conscious about my body figure. Isn't great to finally find a swimsuit that suits you? I wouldn't have posted this here if I weren't happy with what I was wearing - promise!The weather here in metro manila had a summer-like feel lately plus the PFW SS 2012 shows also helped in giving the illusion that summer is here na! So coffeeholics, have you found the perfect swimsuit already? What would you prefer to wear for summer? Tankini, 2 piece, or a 1 piece suit? Do share your summer wear thoughts na!